Why endlessly loop videos when you can let customers interact with your products by marrying the on-screen experience with the product in their hands. You have mere seconds to make a customer’s first experience count. Let them touch and explore your products and deliver perfectly targeted content that drives sales. From kiosks and endcaps to fully interactive video walls or control over any device on the Internet of Things, wow customers with our family of sensors, controllers, readers and screens that transform your retail space into a complete digital marketing experience. Whatever solution you intend to build, smart appliances are the foundation of the [Ei] Platform. Choose a base Node, then add sensors, gadgets and touch-enabled displays to personalize your in-store experience for customers. All Nodes integrate seamlessly with our accessories to enable you to dazzle your audience, whether you intend to deliver a single set of video streams, build an interactive video wall, control light, sound or any connected devices. Fanless configurations are also available for all models, enabling you to install your vision in the harshest environments. Offering far more than mere playback, Nodes are just the beginning of shining a spotlight on your brand. With over a decade of expertise helping businesses develop innovative and proven methods of customer engagement, we work with you to make your products the centre of attention. Our smallest Node, at just five inches square, retains all the power of the [Ei] platform in a compact footprint. Running our [Ei] OS™ Lite edition, based on Android, its universal connectivity and highly responsive interactive speed allows you to play the same type of content as some of the Enterprise versions, in a power-efficient package that can be discreetly mounted virtually anywhere. With more than enough graphics processing power to run many independent frames of content on a single screen, this compact Node provides excellent value for its size. The generous 32GB of content storage gives plenty of scope for delivering dynamic content that your audience will love. The fanless configuration offers an identical tiny footprint with fewer moving parts and greater location flexibility. Using this model you can output visual and audio content sequences on two screens and/or audio devices. Its fanless option helps to provide immersive digital signage experience even in the most harsh environments. Despite its small footprint, this high performance two-channel Node allows you to flawlessly manage interactive kiosks. Moreover, this universal machine opens up the world as an Internet of Things controller where lights, audio, video and custom displays are at your command. Upgrade to the Advanced Edition of [EI] OS and your options expand further, permitting medium-size video walls to be created without the need for expensive external video wall controllers. Combining the raw graphics power of NVIDIA with Intel’s multi-core i7 architecture, this diminutive yet high performance Node can direct independent content streams on up to four screens or audio devices at a time. The generous storage capacity allows you to take customer interactivity to new levels, and with an upgrade to [Ei] OS™ Advanced Edition, driving video walls without needing to purchase expensive video wall controllers is easy. Step up to the compact and powerful six-channel [Ei] Node™ to build engaging content mosaics and video walls. The partnership between the Intel multi-core CPU and ATI Radeon GPU enables you to stream interactive applications and content on up to six independent, unique video screens. This level of performance really opens up the content delivery options in your retail space. As with our other Enterprise Nodes, upgrading to the Advanced Edition of [Ei] OS™ enables video wall support without purchasing expensive external controllers. Join our other customers who found the E6000 a cost-effective way to scale their vision compared with deploying a number of smaller Nodes. Despite its unassuming size, this powerhouse workstation Node has 250GB of fast SSD storage: plenty of space for the most demanding content sequences. Boasting simultaneous broadcast of eight channels of video and audio, it will allow you to exceed your customers’ expectations and deliver innovative, interactive engagement programs. Combining it with our range of gadgets, controllers, sensors and touch displays makes your product or brand leap off the screen into customers’ hands. Expansive video walls usually require purchasing costly external video controllers, but with our Advanced Edition upgrade of [Ei] OS™, video wall support is an out-of-the-box feature, thanks to the phenomenal power of the built-in ATI graphics. 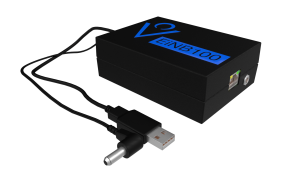 For flawless 4K video, streaming social media or HTML 5 apps, this immensely powerful Node allows you to drive up to twelve unique video/audio channels. Create fabulous mosaics and huge interactive video walls with ease, or connect [Ei] Touch™ screens for swipe/gesture interactivity on independent channels. Don’t let the small form factor of this Node put you off. It’s ideal for demanding applications, such as large video walls or projection spaces. 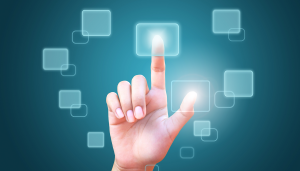 Unleash the power of touch interactivity to deliver a human dimension to your content that will absorb your audiences. Capable, yet compact, our most powerful Node allows you to run up to sixteen unique video/audio channels. Drive multiple screens as if it were one gigantic display, and deliver interactive content in different shapes and forms within it. Combine the E16000 with our [Ei] Touch™ screens and expose a huge interactive application to wow your audiences and customers. Add the Advanced Edition of [Ei] OS™ to deploy a diverse range of sensors and controllers, delivering interactive contextual intelligence that creates an engaging, unforgettable impression. Boost sales and enhance the impact of your engagement programs by giving customers the ability to interact with your products. Our gadgets can be embedded inside kiosks and smart shelves to seamlessly take your base [Ei] Nodes™ to the next level of interactivity. Offering control over any device on the Internet of Things, unleash your imagination to dazzle your audience. Track human behavior, change lighting, visuals and sound in response to customer actions, and collect environmental information to maximize every square foot of your retail space. Upgrade to [Ei] OS™ Interactive Edition to take advantage of our simple configuration engine and open up a world of environmental sensors that add sparkle to any products. Small in stature, big on interactivity, this tiny Internet of Things controller is a one-of-a-kind solution that offers control over any connected device. 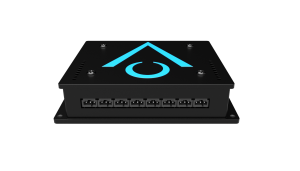 Giving you untold power and flexibility to engage customers, it can be used independently as a stand-alone controller to harness interactive events and trigger actions – even on other [Ei] Nodes™ – or bolted directly onto any Node. Collect data from any ambient sensor, command any device, and manage everything remotely through [Ei] Central™, enabling centralized data collection, configuration, distribution and uptime monitoring of any device in the world. With eight digital and sixteen analogue i/o ports, WiFi (via an additional adapter), audio output and Gigabit Ethernet, the possibilities are limitless. Whether you use it as a teaching aid, or to deliver sensational audiovisual displays, or stunning interactive product demonstrations in public spaces, let your imagination run free. Supporting between two and eight digital i/o ports, one of these tiny boards can handle up to twenty-four devices without breaking a sweat. Bolt a contextual controller onto your base [Ei] Nodes™ and connect a multitude of analogue sensors that can measure continuous quantities, such as temperature, humidity, luminance, position, or pressure. Digital control switches such as push buttons allow you to create what we call contextual intelligence to provide an incredible interactive experiences for your audience. We care about your environment and its uptime. 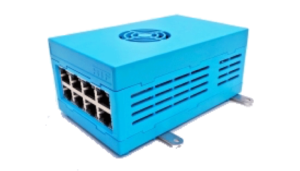 The [Ei] Switch™ is an unassuming, yet accomplished gadget that connects to your hardware and allows you to remotely power on, off or reboot any [Ei] Node™ via Ethernet, WiFi or even over the cellular network. 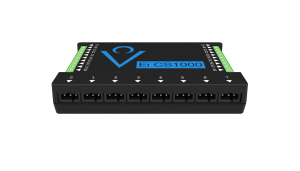 Save costly trips to remote or inaccessible locations by controlling the power of your [Ei] Nodes™ from anywhere on Earth! With no need for static IP addresses or opening your firewalls, it’s ideal for secure or isolated installations running inside a host network. [Ei] Ambilight technology gives you control over the playback and sequencing of light in your chosen environment, kiosk or smart shelf. You can manage light sequences – for example, changing the light order and color – just like you do with regular digital video content. 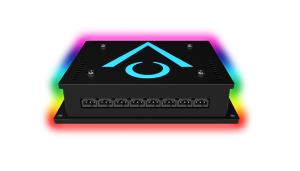 Control mood and lighting by time, day, or utilise the standard feature of any [Ei] OS™ platform device to trigger ambient lighting in response to external input such as customer proximity, picking up a product, or from a touch-based sensor or screen. Much more than a selfie machine, this kit is a ready-made solution for a photo booth experience that engages audiences and promotes your brands. Let your customers take a photo of themselves in your environment, and distribute it via email or social media, completing the end-to-end interactive experience that [Ei] products easily deliver. From cosmetic displays to concerts, customers love to share their experiences with their friends and family, so take advantage of the communication channel. Customer promotions, special offers, campaigns or coupons could be attached to the uploaded photo to further you reach. 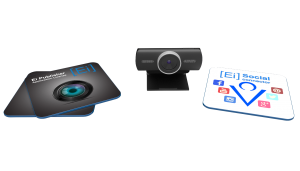 The kit contains a high-quality USB camera, social media connector, and a license for an Application on the [Ei] Publisher™ platform. Deliver sound from your interactive displays in innovative configurations by employing this kit. Supporting up to eight buttons for triggering product selection, it routes audio signals from a single 3mm male jack to eight 3mm female audio ports. Depending on your desired configuration, you can route audio to one or more of the female ports to immerse your audience in sound from your kiosk, smart shelf or public display, ensuring your products take centre stage. 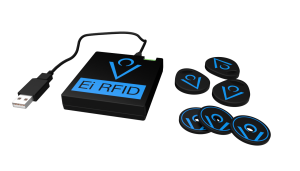 Harness the power of Radio Frequency with the [Ei] RFID module. 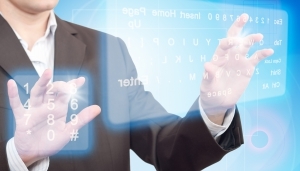 It allows you to address any interactive needs without a touch screen. Activate customized content or deliver a completely different digital experience depending on the identity information read from RF tags within the proximity of your kiosks or smart shelves. With the Advanced Edition of our control software you can very affordably tailor content and track the behavior of specific individuals and groups without complex biometrics or privacy concerns. For example, managerial staff or salespeople could trigger additional on-screen options to assist a customer with their purchase. For any [Ei] Nodes™ that don’t already ship with Bluetooth, this kit adds it. Track the Bluetooth ID of customers within the vicinity of your kiosk, smart shelf or interactive product display, and provide detailed reporting on customer engagement. Use Bluetooth tracking to offer loyalty points or rewards, a completely customized kiosk experience, or simply record the fact a customer has returned for use in later marketing campaigns. [Ei] Sensors™ turn ordinary objects into an irresistible tactile experience for your audience, collecting and interpreting a steady stream of valuable data along the way. Create rules of interaction that trigger events, converting any object into an intelligent device. 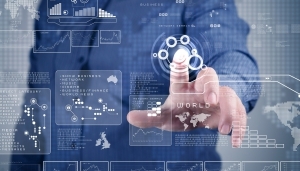 All sensors integrate seamlessly with our Nodes allowing you to construct an experience that complements your business. 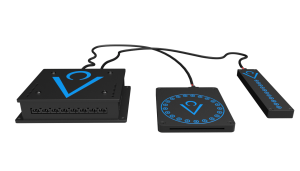 Connect an array of sensors to our Controller Gadgets and immerse customers in your brand to drive sales. Whether you choose light, pressure, motion or touch, [Ei] Sensors™ can be integrated into organic environments to flow with your customers’ natural movements, allowing them to interact with products in new and creative ways. 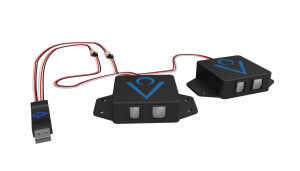 Create contextual communication with your audience with these inexpensive single-input sensors. Depending on the characteristics of your products, pressure or light sensors empower you to detect when a customer interacts with a product. Set reaction rules to provide the best retail experience, for example, trigger video sequences, light, sound, or control any connected device on the Internet of Things when a product is picked up or moved. With our extensive retail experience, we can work with you to create custom displays and mounts to showcase your products to their full potential. Allow your customers to interact with products, not with screens. This multiple input [Ei] sensor has three options: mini joystick, linear or circular touch. Combining these modes of operation with other sensors and [Ei] Gadgets™ you can build a system that recognizes both contact and proximity, detecting touch through materials such as glass, plastic, and paper. 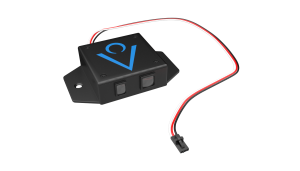 This sensor uses two mechanisms – sonar or infrared – to detect motion and measure the distance to an object. For example, it allows you to track when someone is passing by a product stand or video wall, and set rules of reaction; playing particular content, contacting a salesperson, and many more. The only limit is your imagination! Imagine your environment changes the lighting or plays related video sequences or music when someone comes close to the product stand. 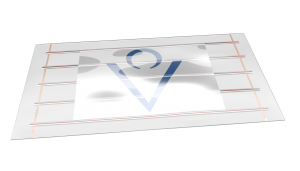 Our contextual mat sensor allows you to monitor a particular area – a floor or a shelf space – and trigger events such as video, audio, light, etc. 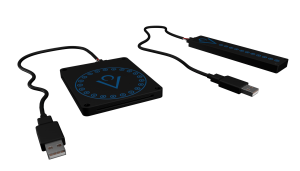 As with all our sensors, combining them with [Ei] Controller Gadgets puts an entire universe of connected devices at your fingertips. Want to know how many customers use particular entrances to your retail space? This kit can help. Whether your have rotating or flat doors, of any dimension, the kit is able to efficiently collect and help you to subsequently analyze customer movement. Combine it with our other proximity or contextual sensors and Controller Gadgets to map customer movement, and tie it to sales to see how your retail space is being used. Armed with this knowledge you can then design displays to maximise every inch of your environment. Engage customers with an immersive interactive experience using [Ei] Touch™ glass, which is twice as smooth as the new iPad and twelve times smoother than ordinary touch-screen products. An embedded high-end optical chip offers reduced power consumption, while increasing performance at the same time. Place it over any SMARTe fixture, kiosk, or even your video wall to provide stunning touch interactivity for your audience. [Ei] Touch™ includes an IR overlay, tempered glass and comes in sizes of 19″, 21″, 24″, 27″, 32″, 40″, 42″, 46″, 55″, 60″, 65″, 70″, or 80″. Screens of 46″ or smaller can be powered through a USB connection, providing simplified installation and more design flexibility. The coin-thick, elegant two-touch glass boasts a near-flush surface design that will provide your audience with a highly accurate touch experience. It can be integrated with any of our smart fixtures or just overlaid on an existing screen, in both cases delivering lightning response, high performance and unparalleled reliability. The glass in this kit can recognize up to six touches at a time. Its ultra-smooth surface presents an icy-sleek interactive experience. Due to a high refresh rate and rapid response time, it allows smooth and accurate touch gestures to be relayed to your applications. Elegant yet powerful, this glass delivers high performance with low energy consumption. 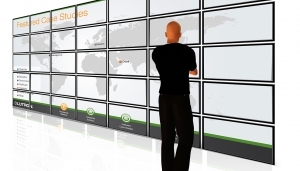 Build immersive multi-touch, multi-user walls, that are customizable to five hundred feet. Combined with our multi-channel media Nodes equipped with [Ei] OS™ Interactive Edition, an installation of the customer multi-touch video wall kit creates a powerful interactive display for any educational, retail, venue or experiential environment.